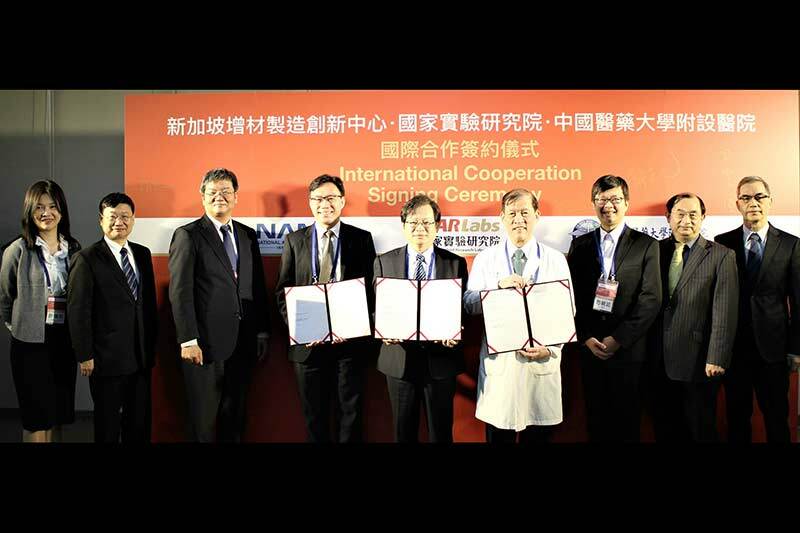 Taiwan’s National Applied Research Labs (NAR Labs) and China Medical University Hospital (CMUH) have come together to establish a strategic partnership with the National Additive Manufacturing Innovation Cluster (NAMIC) in Singapore. An international cooperation signing ceremony was organised on 27 March, where the parties jointly announced that they will collaborate on a range of 3D printing initiatives focused on bio-medical applications, in the areas of education, research, translation, and commercialisation. Singapore announced plans in 2013 to invest S$500 million (US$380 million) in 3D printing under a Future of Manufacturing scheme. NAMIC is a national programme initiative in Singapore, led by NTUitive, the Innovation and Enterprise Company of Nanyang Technological University (NTU), to translate upstream 3D printing research in universities and Institute of Higher Learnings (IHLs) into downstream commercial applications, as well as lower barriers for companies to incorporate additive manufacturing technologies into their core businesses. It is supported by the National Research Foundation (NRF), Prime Minister’s office, in partnership with SPRING Singapore and the Singapore Economic Development Board (EDB). The founding cluster members of NAMIC include the National University of Singapore Centre for Additive Manufacturing (AM.NUS), Nanyang Technological University Singapore Centre for 3D Printing (SC3DP), and the Digital Manufacturing and Design Centre (DManD) of the Singapore University of Technology and Design. This is the second international collaboration initiative from NAMIC. The first such collaboration was initiated in October 2017 with Shanghai Additive Manufacturing Association (SAMA) and Shanghai Additive Manufacturing Innovation Centre (SAMIC). This initiative is in line with the Taiwan Government’s Southbound Policy which aims to enhance cooperation and exchanges between Taiwan and 18 countries in Southeast Asia, South Asia and Australasia. To strengthen the competitive advantage of Taiwan’s industry in medical grade 3D-printing manufacturing, “NARLabs Medical Instrument Value Creation Alliance” was established in 2014 and is headquartered at the ITRC (Instrument Technology Research Center). The alliance actively expands the industry value through chain integration, in which Tongtai Machine & Tool and TTMC are key strategic partners. Further, on 14th July 2016, NARLabs, Tongtai Machine & Tool, China Steel, and TTMC launched a 3D-printing Joint Laboratory in Hsinchu Biomedical Park to develop medical material and manufacturing equipment domestically, and announced a collaboration to promote Taiwanese biotech and medical equipment on the global market. CMUH is the first integrated Chinese and western medicine hospital in Taiwan. A 3D Printing Medical Research & Development Center was set up in collaboration with Asia University, Taiwan, and the Georgia Institute of Technology (Georgia Tech) over three years ago. The Centre carries out advanced R&D of medical technology related to 3D printing and develops customised biomedical devices. The three-party cooperation will bring international resources, funding, and research team into the Hsinchu Biomedical Park. This will deepen the mutual understanding between the Taiwanese and international teams. At the same time, the access to international market resources and marketing channels will promote Taiwan’s biotechnology sector.